1.Piano must be kept with proper pitch,this means 440 Hrz for standard pitch. Wether played or not often,the strength of the wire strings will loose its capacity to low,so then maintenance service is required in this case.If its not in standard pitch,the quality sounds not in good condition,meaning bad for education children by hearings.6 months maintenance service is recommended. 2.Avoid to placing the piano in front of the windows . These means to prevent some noises interruptions by window. 3.Avoid placing piano down by the stairs,it’s high humidity temperatures,if its have to,you might needed more damp chaser humidity. 4.Never put the things and containing liquid element on top board piano.These means to prevent some noises interruption (point 2) and to prevent water spilled out into the Action. 5.Close the top board and the fall board after played. 6.Put the piano moreless 10 cm to the wall. 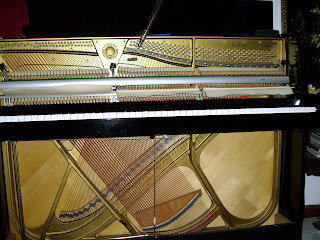 7.Clean the piano cabinet with softener liquid ( some factory recommended ) to maintain the finishing body stayed shiny. 8.Avoid using damp cloth or wet cloth,use soft and dry cloth only. 9.Tune your piano up with an experience piano tuner,six months for minimum period. 10.Never try to tune your piano your self if you don’t know any rules of it,this means to prevent break strings and other damages causes.Contact your experience piano tuner in your area,make an appointment to fix your piano problems.